We’re back with the Impel Trading Cards! The following cards take us back to the Joe team after seeing some of the coolest vehicles and playsets. 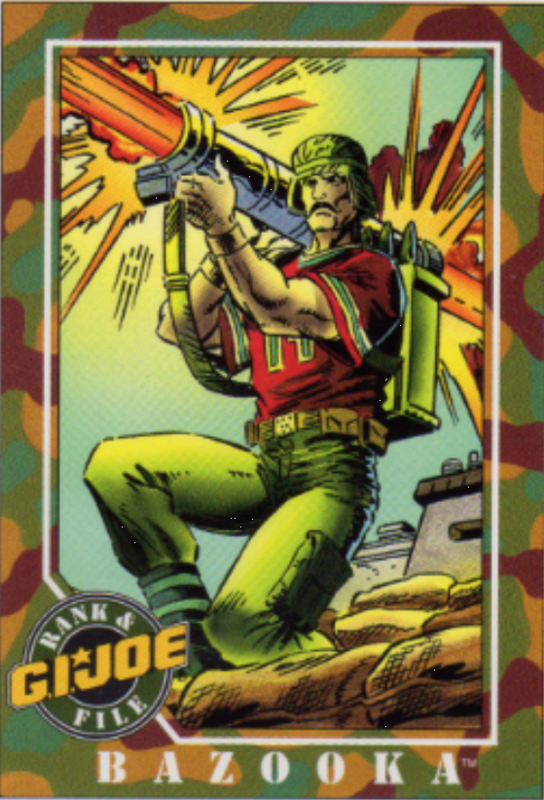 Up next is card #19, David L. Katzenbogen, better known as Bazooka. Apart from the big stache, he stands out because of the bright red football shirt, that appears to belong to New England Patriots quarterback Steve Grogan. 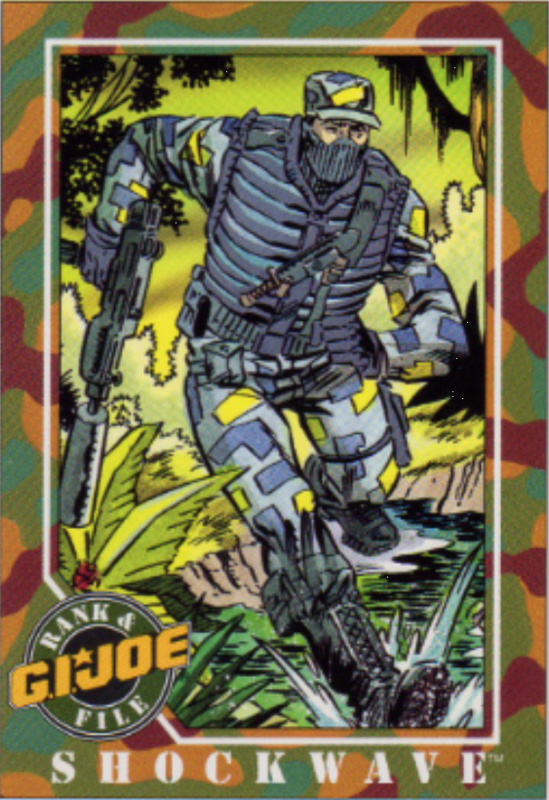 The card art shows him defending a structure (the G.I. Joe Headquarters? – see the post on Card #18). His filecard depicts him as a swift, strategic thinker. And in the comics, that seems to be the case. The Sunbow Cartoons, however, show Bazooka as being a bit of an oaf. There are 8 figures made (4 as Bazooka, 3 as Sgt. Bazooka and 1 Sgt. Katzenbogen – Hasbro, get your rights straightened please). Of those, I only have the latest figure, the 2015 version (the fourth version named Bazooka). This figure was not dressed in red, but in 50 shades of blue as part of the 50th Anniversary line. He was packed in the Sneak Attack pack with Specialist Dusty and Firefly. Recently, I have seen Bazooka die 2 times (once in G.I. Joe: Resolute – we got this on DVD here a while back and again in the IDW new run of G.I. Joe – issue 15). He seemed like a nice guy, liked by all the Joes. I leave you now with the words Stalker dedicated to his fellow Joe. 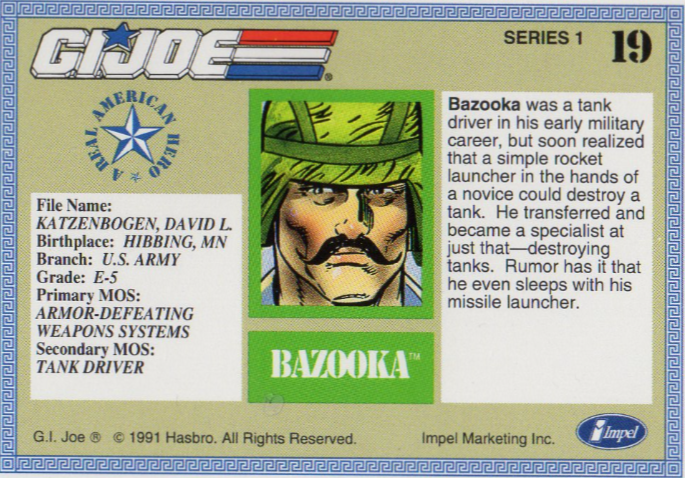 David L. Katzenbogen died so that Bazooka could be born. Bazooka died so his fellow Joes could live. Bazooka gave it all for his country and for the Joes. He made some mean firehouse chili and he was always there where the lead was thickest. When the last bugle calls for you – pray you’re half the Joe your brother was.